sold with NO UPWARD CHAIN Viewings are strongly recommended as photos and words do not do this property justice. This gorgeous home comprises of a spacious and bright entrance hallway that spans from the front of the property to the rear giving it a wonderful homely feel upon entry. The hall then gives access to a spacious, bay fronted living room with feature fire place. To the rear there is a separate dining room with french doors accessing a large conservatory looking out onto the enclosed rear garden. The breakfast kitchen is also accessed from the hallway and benefits from a gorgeous island breakfast bar in the centre of the room as well as fitted appliances and an additional utility room. Finally to the ground floor there is a downstairs w/c and third reception room which is currently being used as an office. To the first floor the property benefits from an enormous master bedroom with en-suite bathroom. Bedroom two and three are also large double bedrooms as well as being connected by a jack and jill en-suite. There is then a fourth double bedroom, one single bedroom and a large family bathroom suite. 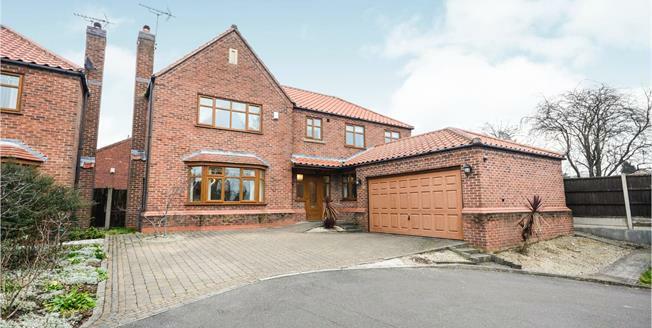 Additionally the property benefits from off road parking for numerous vehicles, double garage, under floor heating and an enclosed rear garden. Please call the office for viewing arrangements. Front double glazed door, opening onto the driveway. Underfloor heating, tiled flooring, ceiling light and french polished stair case. Double glazed uPVC window facing the front. Electric fire and underfloor heating, polished laminate flooring, ceiling light. UPVC French double glazed door, opening onto the garden. Underfloor heating, polished laminate flooring, ceiling light. UPVC French double glazed door, opening onto the garden. Triple aspect double glazed uPVC windows facing the rear overlooking the garden. Polished laminate flooring, ceiling light. Double glazed uPVC window facing the rear overlooking the garden. Underfloor heating, tiled flooring, ceiling light. Fitted, wall and base and drawer units, belfast style sink, integrated, electric oven, integrated, gas hob, over hob extractor, integrated standard dishwasher. UPVC back double glazed door. Underfloor heating, tiled flooring, ceiling light. Roll top work surface, fitted, wall and base and drawer units, stainless steel sink, space for washing machine. Double glazed uPVC window facing the rear overlooking the garden. Heated towel rail, laminate flooring, ceiling light. Low level WC, jacuzzi with mixer tap, wash hand basin with mixer tap, extractor fan. Double glazed uPVC window facing the side. Radiator, carpeted flooring, ceiling light. Low level WC, double enclosure shower, pedestal sink. Double glazed uPVC window with frosted glass facing the front. Radiator, vinyl flooring, ceiling light. Low level WC, roll top bath with mixer tap, pedestal sink with mixer tap.